I think a touch of velvet is always stylish, especially during the winter months. 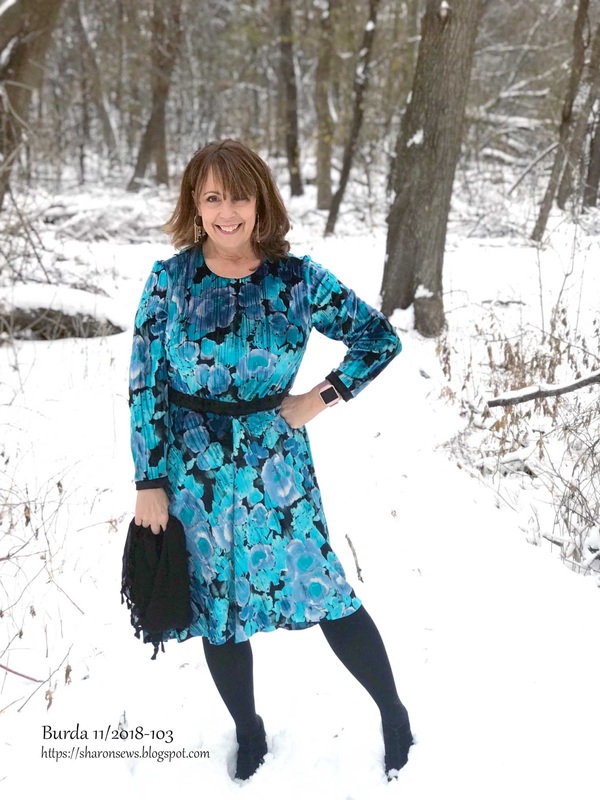 My latest floral velvet dress could be worn at the office with tights and booties or be dressed up with fancier accessories and strappy heels for a dinner date with hubby. The pattern is BurdaStyle 11/2018 #103, a panel seam dress designed for knits. The fabric for my dress is a stretch velvet purchased within the last year or so, although I don't recall where. 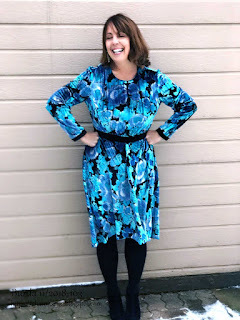 I choose the dress pattern for a number of reasons: the ability to easily do an FBA, the hi-low hemline, the comfort of knit, and the fact that this was a "tall" BurdaStyle pattern, which meant the waistline would likely hit my waist without an adjustment. Spoiler alert: it didn't. As you can see from the line drawing, there are a number of great design details. The Dior dart (that short dart from the side panel), the darted elbow, and a small pleat at the center front of the skirt with adds to the fullness of the skirt without a lot of bulk, and the waistband defining the waistline. I wasn't sure how to do the FBA on this type of dart, so I approached it like a princess seam. This is what my full bust adjustment pattern alteration looked like. It might not be the correct way, but it worked! I debated about using a contrast fabric or the same fabric for the band at the waist, and you can see I went with the contrast. I thought since my waist has completely disappeared this year (sigh...) the contrast might give the illusion of a waist. Alas, I don't think it does the trick. Also, since I didn't add length to the bodice (except what was added with my FBA), the band hits my almost 2" above my actual waistline. 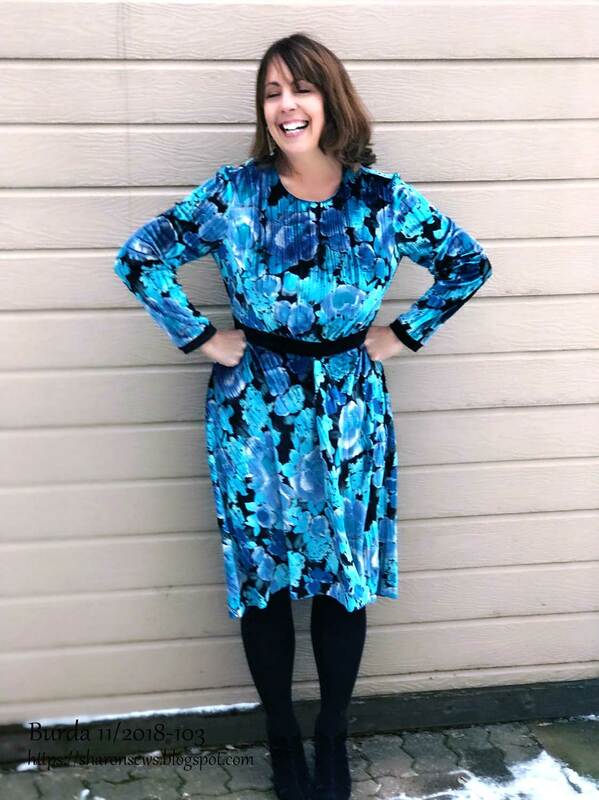 Now that I see photos I think the same fabric might have helped camouflage my lack of waistline better. Oh, a note if you sew this dress. 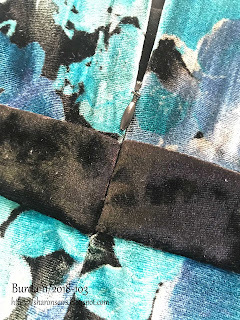 The waist band is interfaced and lined so there is a lot of bulk at the waistline when stitching the side seams and the adding the invisible zipper. I think I did a pretty good job of matching that waist band at the center back! 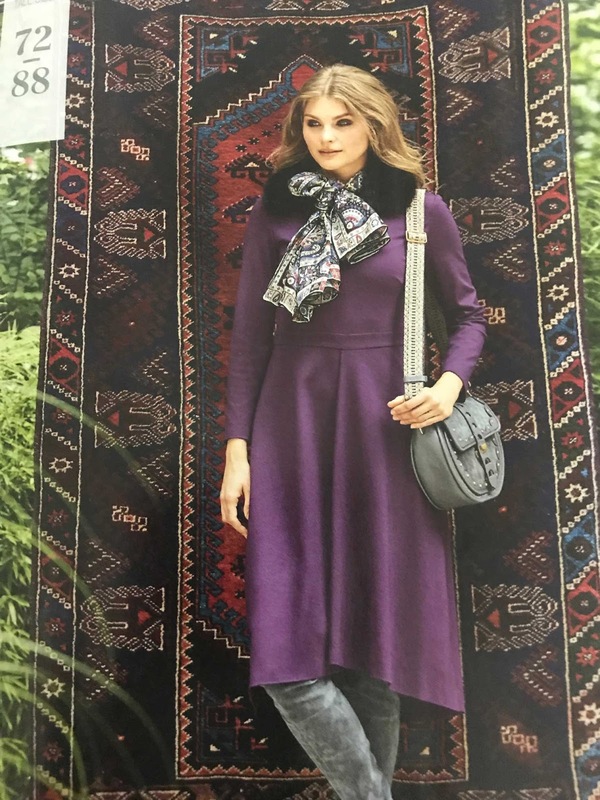 As I mentioned earlier, this is one of BurdaStyle's "tall" patterns, designed for 69-1/2" instead of their usual 66-1/4". 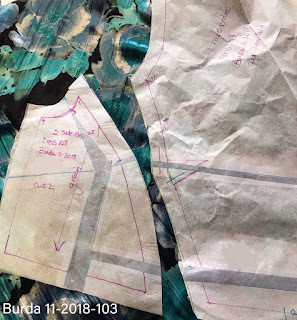 Instead of checking the pattern, I made an assumption that the bodice would be long enough that I wouldn't need to lengthen it to hit my natural waistline. Well, I should have remembered what my mother always said about making assumptions, LOL! I also discovered the sleeves were too short, which I found odd as I typically have to shorten sleeves. I simply added a small contrast band. I did, however, shorten the skirt by 3". All in all, I'm pleased with the dress. 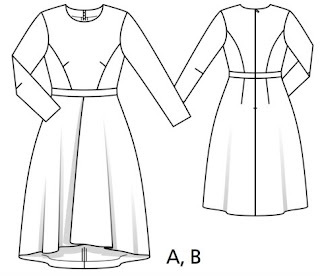 The more I sew BurdaStyle patterns, the more I appreciate the designs and the drafting. 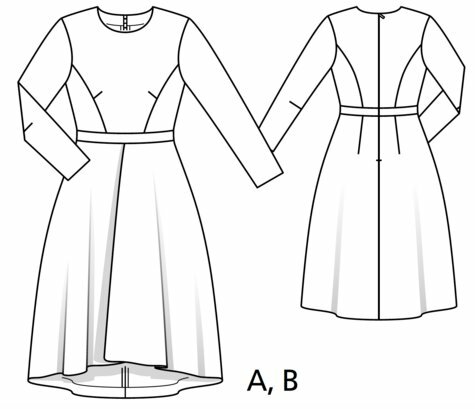 While the instructions are limited, the pattern pieces always seem to go together perfectly. One final shot on this cold,winter day as I'm loving how the blue velvet pops against the backdrop of fresh snow. 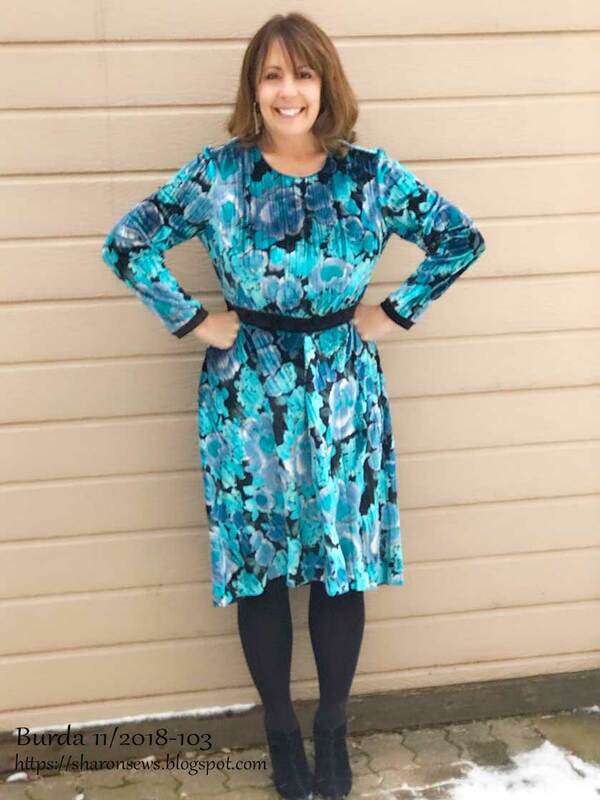 As someone who has no waistline AT ALL believe me the solid dark color at your waist definitely provides waistline definition to this very pretty dress! Love that so much velvet is being sewn and shared in the sewing community. Your dress looks gorgeous! Velvet certainly seems very popular this year. Love your dress! How much do you usually add to Burda patterns to lengthen the bodice? I always add 1 inch. Such a pretty dress. The colors and style look wonderful on you. I will admire the snowy landscape in your picture and be thankful we haven't gotten any snow yet. I'm guessing that velvet is tough to sew on, but boy are the results lovely. The color and print of this fabric are gorgeous! This is a Christmas "destination" dinner dress!!! Gorgeous especially in the snow.